How about that water on Mars? NASA announced a big press conference over the weekend about the planet Mars, and I took time out of Algebra II yesterday to watch it with my students. As most people expected, they announced evidence of liquid water on Mars. So what's the big deal? 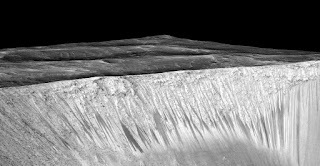 For some time now, scientists have observed seasonal streaking on slopes on Mars. You can see some of the streaks in the image above (courtesy NASA/JPL/University of Arizona). They've been called RSL, which stands for Recurring Slope Lineae, which means, "lines that appear repeatedly on slopes." That certainly seems like the action of some kind of liquid running down the slope making the surface appear darker. Homo naledi has been a delightful development in my life, and I had nothing to do with the actual research. I just got up one morning and found two emails from some very early risers who had already read the press coverage. 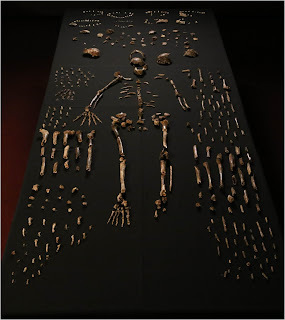 That derailed my whole day's work as I concentrated on better understanding what exactly Homo naledi was and what it might mean for my understanding of creation. Few things get me more wound up than new hominin fossils. Dawn of Humanity or Dawn of Recovery? 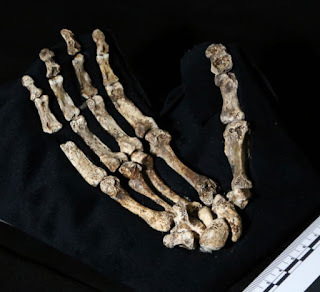 Tonight on PBS, you can watch the latest NOVA/National Geographic co-production, Dawn of Humanity, focusing primarily on the Homo naledi discovery. Or you can visit the NOVA website to stream it right now, or you can get it on Amazon and stream it there. I just wanted to share a few thoughts about the special, because the film stirred up all sorts of excitement in me (again). First of all, a disclaimer is in order: this movie is thoroughly, unabashedly evolutionary. I know that should go without saying, but I continue to be surprised by folks who are surprised by how conventional science is so thoroughly evolutionary. Newsflash: These fossils are interpreted in terms of human evolution on this program. 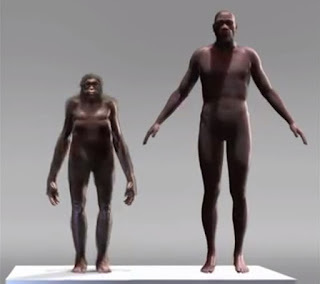 Human evolution means ape-like creatures evolving into human-like creatures. Don't expect anything better than that. What can we learn about Homo naledi? I've had a day to digest the publications about Homo naledi, and I'm still just as excited as I was yesterday. There are at least twelve other people in the world almost as excited as I am, since I told them yesterday to do homework because there are some things in this world more important than algebra. I'm currently writing up my results, but unfortunately for you, I won't be spoiling them here. I'm a firm believer in peer review to make sure I've done my due diligence. I will be submitting my manuscript for formal publication in a journal, and until then, I'm going to keep a lid on things. In the mean time, though, I wanted to offer a few additional thoughts. Wow, I'm kind of shell shocked this morning after receiving word of the richest hominin fossil discovery in Africa. 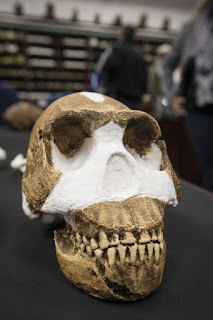 Lee Berger (discoverer of Australopithecus sediba - the fossil that got me into so much trouble five years ago) is back with a new fossil he calls Homo naledi. The remains of Homo naledi were found in the "Cradle of Humankind" world heritage site, about 30 miles northwest of downtown Johannesburg. The thing that makes this discovery special is the sheer quantity of material: Two excavations in 2013 and 2014 recovered more than 1500 individual bone pieces, about half of which can be diagnosed to the skeletal element. Check out the picture below (and if you're a nerd like me, hold onto your jaw, because it's going to drop).